Whether you need a little (or maybe a lot) of help choosing a design or would just like a little guidance with the assembly of your Summerwood building, drop us a line and we'll help you out in anyway we can. Yes, I'd like to receive information on specials and updates on new products. Currently offline. Please leave a message. Come in for a visit and we'll use our Custom Design Centre to help you build the design of your dreams. You'll also find a variety of products on display. Send your thoughts and ideas directly to our experienced design specialists and they will give you all the help you need to get the ball rolling. They love to help. Send us your preferred time and day. We'll confirm and be ready for you with a hot cup of coffee when you arrive! Our Toronto show room is a warm and friendly place where are a number of our products are showcased. Come for a visit and we will welcome you with open arms! 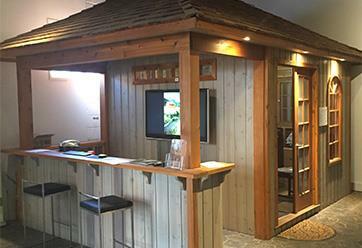 Featuring cedar shingles and frosted glass doors, our surfside open bar is the ideal entertainment spot while the enclosed area can be used as a guest house or changing room. 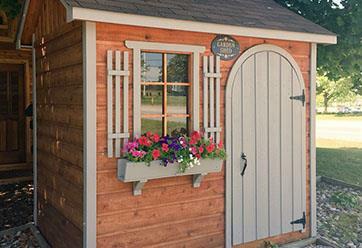 This stunning shed features an arched door, windows and flowerboxes. 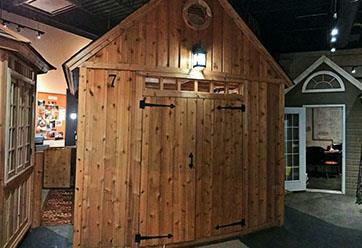 Our cedar Palmerston shed is our most popular shed and its traditional design adds charm to any garden setting. Please call or email us for more information. or visit the quote page for building details. Visit our magnificent cottage Bunkie. The unique building is a favorite among our customers. It features bright and spacious interiors and a functional loft above for added storage or sleeping quarters. It’s the ultimate weekend getaway spot! Please drop by and see our modern home office. Featuring a 4-panel sliding door and a majestic 4 ft. overhang in the front, this contemporary building makes it the ideal space for your home office needs. Our elegant gazebo is a great place to read, dine or entertain your guests! With windows on all the walls, you never feel enclosed. Whatever you do, you’ll enjoy the luscious Western Red Cedar interior and gorgeous opening casement windows. 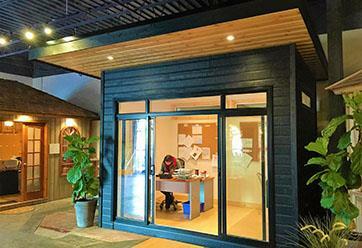 This beautiful home workshop is highly functional and built with a 10/12 roof pitch for some extra space above. The versatility of the space allows for plenty of storage for stowing and organizing all your tools and gear. We have received your message. You will hear back form us promptly, usually within one business day. Below is a list of pre-install site photos which we require to ensure that your installation goes as smoothly as possible. - Front and side angles of the site. - Nearby obstacles such as shrubs, trees, or fences, showing their distance from the site. - Site access: a photo or two of the route from the drop spot to the site. - Drop spot: the location where the shipment will be placed on delivery. Thank you, we look forward to your visit. Thank you, one of our design experts will be in touch shortly!